This show definitely needs to go on my list of Top Character Introductions in Pilots. While the whole episode is about the main character, the President of the United States (Martin Sheen), we only meet him in the last five minutes. His entrance is unforgettable; and his character is classic Aaron Sorkin. When you’ve seen one or two pieces of Aaron Sorkin’s work, it’s easy to spot another one. Unless The West Wing is your first introduction to the genius behind A Few Good Men, The Social Network, Sports Night and yes, Studio 60 on the Sunset Strip, this pilot screams “Sorkin wrote me” the whole time. It opens with a bunch of individual people going about their individual lives, each receiving a message about an emergency: Press Secretary C.J. (Allison Janney) during her 5am workout, Deputy Chief of Staff Josh (Bradley Whitford) while he’s sleeping at his desk, Communications Director Toby (Richard Schiff) while he’s arguing with a flight attendant mid-flight, Sam, Deputy Communications Director (Rob Lowe) while showing at the apartment of his previous night’s hookup. The message? POTUS was in a bicycle accident. There’s some build up to revealing what the acronym stands for, thought it’s not much of a surprise: President of the United States. The plot unfolds primarily around Josh’s gaffe. The press corps is on hand to hear about the bicycle accident but they’re actually sniffing around for news that the President is going to fire Josh. We are shown the footage of the talk show where he insulted the Christian, one Mary Marsh, saying, “Lady, the god you pray to is too busy being indicted for tax fraud.” While most of the staff assume he’s made his bed, Josh, director of public relations, steps in to smooth things over. He has arranged a radio address on family values and a meeting between Josh and Mary. At the start of act 2, we’re introduced to another character, Mandy (Moira Kelly). She is returning to a career in Washington after being away for some time, she is an ex of Josh’s and she takes no crap, from cops or anyone else. She, like everyone else, is full of advice for Josh. Suspense builds throughout the hour until we learn what decision POTUS will make. Though the episode jumps around quite a bit from place to place and from character to character we are given a full picture of these people, their priorities and their lifestyle. There are some hilarious moments, like one where Sam misunderstands to whom he’s giving a White House tour. It all builds to the crescendo of the President’s entrance. It puts any jokes about his riding his bike into a tree right to rest. I won’t spoil it just in case you haven’t seen it. 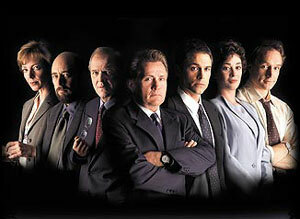 This entry was posted in 2000s, Dramas and tagged a few good men, aaron sorkin, allison janney, bradley whitford, dialogue, martin sheen, Moira Kelly, moneyball, potus, richard schiff, rob lowe, sports night, studio 60 on the sunset strip, the social network, west wing by meekthegeek. Bookmark the permalink.